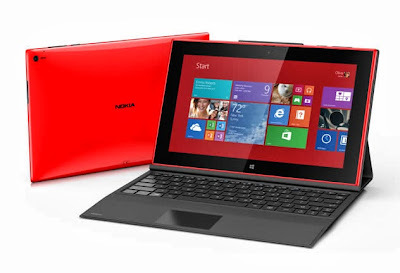 On tuesday 22nd october Nokia announced officially its first tablet Runs A windows 8.1 operating system. Yes we're talking about Lumia 2520 here. We'll be sharing some features and specifications of this new device i.e Nokia Lumia 2520. There are many positive things that are included in this new Lumia 2520. This is the Nokia's first tablet which comes with pre-loaded Windows RT (A windows 8 platform was especially built for mobile devices). Lumia 2520 has a 10.1 Inch Full HD Screen display. Also having support for LTE. There are also some In-built Apps in this device. Nokia also announced power keyboard alongside the Lumia 2520. I think this tablet is a good choice for business people because its pre-loaded with microsoft windows 8.1 RT and microsoft Office, It also has other pre-installed Microsoft apps, like Mail, Xbox Music, and SkyDrive which are helpful for every one i think. And purchasing the power keyboard will improve its credentials more because this adds a full QWERTY keyboard, 2 USB ports and another battery which has up-to 5 hours of battery life capacity for your tablet. As we mentioned above the Nokia 2520 comes with pre-installed of mircrosof apps, but not only that there are also some other apps added by nokia himself Such as Video Director -This is a video editing app .this app will let you 'Combine 2 videos in one, Adding title screens, sound effects, music, and design elements can be done with this app'. Other is Nokia Music- which provides access to tons of audio music for streaming online free. Nokia Lumia 2520 Features a 6.7 Mega Pixels of a primary camera, Auto- focus Zeiss optics with an aperture of f/1.9.There is also a 2 MP of front face camera which can be used for chatting, skype calls etc. Battery life is depend on the type of work also whether it is a tablet, laptop or a mobile phone. But the Nokia Lumia 2520 has an 8000mAh built-in battery which is capable to play 11 hours of continuous video which is so good. Nokia Lumia 2520 features 2.2 GHz quad-core Snapdragon processor and 2GB of RAM. Device is also comes with 32GB of available memory which can be expanded by a 32GB of more external memory. Operating System: Nokia Lumia is running on Windows RT 8.1. Processor: Tablet has 2.2 GHz quad-core Snapdragon processor and 2GB of RAM. Memory: The Lumia 2520 comes with 32GB of on-board Memory with expandable memory of 32GB with MicroSD Cards. Camera: This tablet has 6.7 Megapixels Auto Focused Zeiss optics with f/1.9 aperture of primary camera And a 2 MP HD wide-angle Of a front-face camera. Size And Weight: Size 267 x 168 x 8.9* mm, Device weight is 615 g.
Colors: colors of this tablet are: Black, White, Red and Cyan. Stay in touch with Tech Web World to get more informative stuff from us!